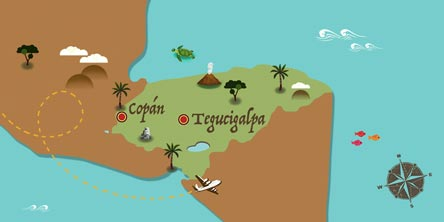 In Copán, one of the main tourist centers of Honduras is one of the most important archaeological remains of the Mayan culture. In its capital, Tegucigalpa, is where most of the country's commercial centers are concentrated, in addition to the La Tigra National Park, the first in the country to have this distinction. Passport must have six months validity and one blank passport page. No visa required for stays of up to 90 days. no mandatory vaccinations but please check with your doctor.